Photo: (Top) Mike Krzyzewski and Bobby Knight after Coach K broke Knight's career record. 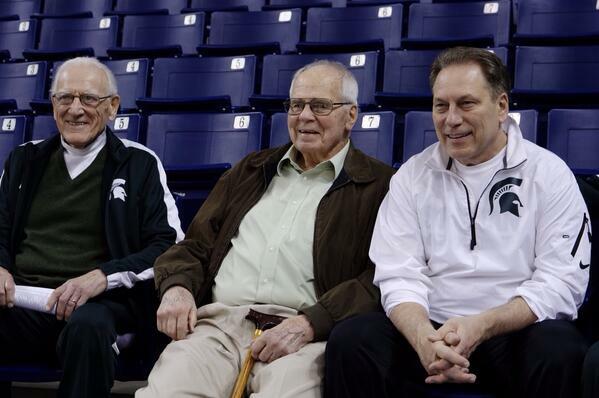 (Below) Michigan State's three coaches the past 45 years (l-r): Gus Ganakas, Jud Heathcote and Tom Izzo. The first time I saw Mike Krzyzewski coaching was 40 years ago, but I was unaware of the moment. On a fateful Jan. 4, 1975 afternoon at Michigan State's Jenison Fieldhouse, nobody was aware how to spell or pronounce his name unless they were an Army basketball fan in the late 1960s. Krzyzewski had played for Bobby Knight at Army, leading West Point to the 1969 NIT as a senior point guard. After Krzyzewski fulfilled his five-year military commitment, he spent one year with Knight as an assistant and Indiana before he was named Army's head coach. The rest is history once he landed the Duke job for the 1980-81 season. So many wins and events have unfolded since Coach K traveled with then-No. 2-ranked Hoosiers to face Michigan State, a team coached by Gus Ganakas. I was a freshman at Michigan State and had arrived early enough to claim mid-court seats across from the team benches. I looked for Knight, already well known for his temper, and his players that formed the nucleus of his first NCAA championship team a year later. I no doubt saw Krzyzewski and dismissed him as "a nobody." The Indiana-Michigan State game turned out to be the darkest chapter in the Spartans’ basketball history. Michigan State’s 10 black players walked out on Ganakas, a classy man who deserved better. Ganakas’ improvised varsity lineup was left with three white freshmen recruits. One was starter Jeff Tropf; the other two were seeing time on the JV squad. As the startling scene unfolded, I wonder how the future Coach K observed a basketball team in crisis. He saw Knight support Ganakas as a respected colleague. If I ever had a one-on-one with Coach K, that’s what I’d ask him. Knight had approached Ganakas a couple hours before the game. He volunteered to have Quinn Buckner, an Indiana black player and Renaissance Man, talk with the Spartans’ black players. Ganakas and Knight were friends as disciples of the legendary Pete Newell. Ganakas coached down the street at East Lansing High when Newell was at Michigan State (1950-54). Ganakas was later hired as an assistant under John Bennington, previously a Spartans assistant under Newell. Ganakas suspended his players for the Indiana game, resulting in a 107-55 mismatch loss. They would be reinstated before the next contest in what finished as a 17-9 season. At the time it appeared to be a black-white issue, but the players later explained grievances over what was perceived as the basketball program’s second-class status to football. Understand that Michigan State’s athletic department was in disarray in the early 1970s under relatively new president, Clifton Wharton, and his administration. College Football Hall of Fame coach Duffy Daugherty had retired after the 1972 football season, just two years earlier. He had complained about a lack of financial support under Wharton. He felt Michigan State was handcuffed at the bottom of the Big Ten in funding alongside Northwestern at a time when bitter rival Michigan enjoyed a rebirth under a young Bo Schembechler. If Duffy felt that way about football, where did that leave the basketball program and its perceived second-class status? For that fateful game I had arrived early for seats at the half-court line that were available on a first-come, first-serve basis. This was pre-Twitter and ESPN and thus before anyone in Jenison understood what happened with the walkout. I had saved a seat on what were benches for my friend Jim Watts, who arrived with his friend Dan Riewald. We were Wonders Hall residents and managed to squeeze in Dan, but he watched the loss in added anguish. What I wouldn’t give to freeze-frame that moment to scan back to the Indiana bench to observe Krzyzewski, who was then a recently retired Army captain. He no doubt studied the scene with his West Point training. What did he learn that day about coaching that would serve him well as the immortal Coach K? I've seen Knight's good side when he feted Newell at a San Diego Hall of Fame dinner, and it’s indelible. He can win you over if he gives you a chance, but unfortunately he didn’t with many people. Bobby's black Knight side is unpredictable. The honorable West Point Black Knight side of Coach K is among the reasons he is more respected than his mentor. But what early lesson did Coach K learn from Knight, among many others, that fateful afternoon 40 winters ago at Michigan State?